Sweet Pea and Carmine, working on the Treadmill and getting great results. Why should I put my dog on the treadmill? January is National Train Your Dog Month and Walk Your Pet Month, so why not do both. Keeping your dog in shape during those cold winter months can be a bit trying if you don’t want to go outside for long periods of time. Some dogs will not or cannot walk in extreme weather conditions (i.e. heat, cold rain, or ice). Another reason walking outside isn’t always an option is if a dog is fearful or reactive in his neighborhood (sounds, sights, smells or surfaces). If your dog is in the midst of a training program for leash reactivity, for example, keeping your dog away from other dogs is an important component in the beginning stages of the training plan. 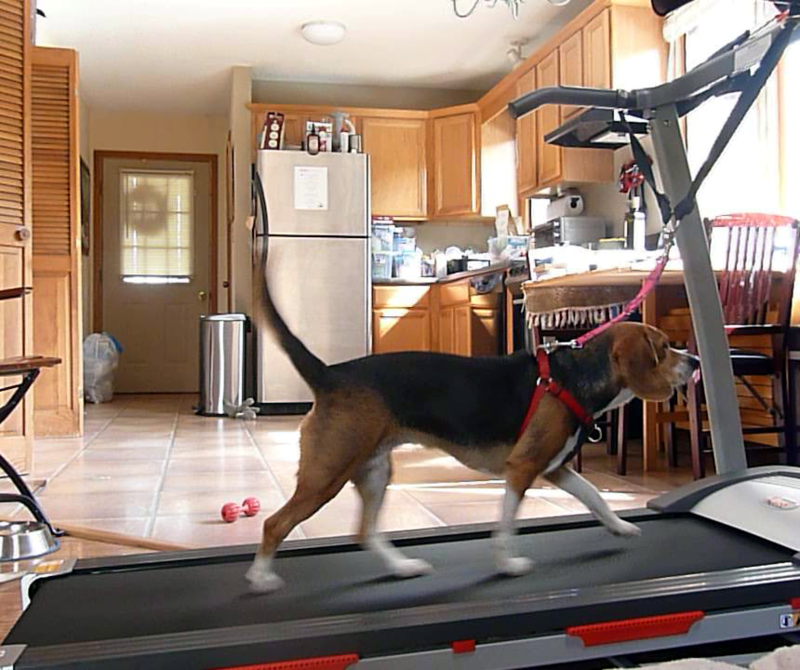 Using a treadmill can be extremely beneficial for keeping your dog active in such instances. Yet another reason is that a simple walk around the neighborhood often isn’t sufficient to drain your dog of energy. Introducing him to the treadmill if you can’t jog him is a great solution. How do I start training my dog on the treadmill? Associate the treadmill with positive and rewarding things. For most dogs, food items are rewarding. Be sure the food item is high value to your dog and appropriate to his diet. Remove your dog to an area away from the treadmill; sprinkle a handful or two of high value treats on and near the treadmill (treadmill should be off the entire time). Bring your dog into the room (off leash), have a seat near the treadmill and see what happens. Most dogs will run up to the treats and start to eat them all up. Other dogs might be a bit more cautious and take a few minutes before they work up the courage to explore and eat the treats. 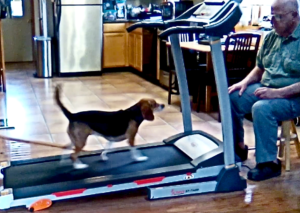 It is important that your dog is never forced to approach the treadmill. Allow him to make the choice. As soon as all of the treats have been eaten, play a fun game with your dog or give him a long-lasting treat (such as a KONG with peanut butter) in another room. You want the first interaction with the treadmill to be short and sweet. If your dog is afraid of the sound the treadmill makes, have a friend help you with this stage. Start with your dog in the furthest part of the house and have a stuffed KONG or high value treats ready. Have a second person turn on the treadmill as you stay with your dog in the other area of the house. As soon as you hear the treadmill is on, give your dog the KONG or start giving him the high value treats. After a few seconds have your friend turn off the treadmill and stop giving your dog treats (or take the KONG away). Repeat this several times throughout the coming week. In time your dog will learn that the sound of the treadmill means delicious food is coming his way. After a few sessions, you can start to move your dog to a room in the house that is close to the treadmill, while continuing the training plan of giving treats when he hears that the treadmill is on. Eventually you will be able to have your dog in the same room as the treadmill, while it is on, and have him look forward to his treats rather than be fearful of the sound. My dog is on the treadmill, now what? Once your dog is on the treadmill you will want to keep in mind some best practices. 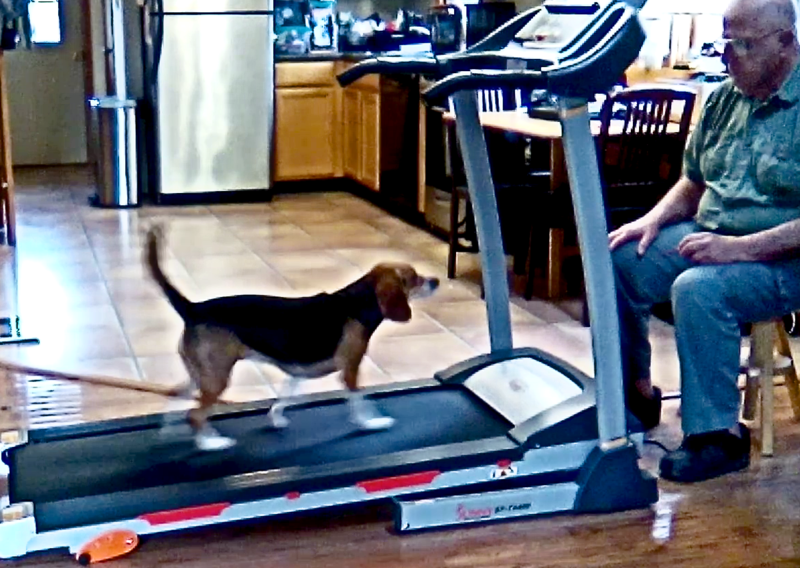 Always supervise your dog while he is on the treadmill. Keep sessions short and sweet – at the beginning your goal should be to simply get your dog on the treadmill (while it is off). Slow and steady wins the race. Gradually build up to your ultimate goal of how long and how fast you want your dog to walk on the treadmill (with your veterinarian’s recommendations). Keep it fun! You want your dog to look forward to getting on the treadmill. Quit while you’re ahead. Always end the session while your dog is still having the time of his life – not when he is slowing down or showing signs of stress. Only use the treadmill when your dog is well. If your dog is sick or injured, or you suspect he is sick or injured, do not continue using the treadmill until you have cleared it with your veterinarian. Keep the area distraction-free. Having your treadmill in a quiet part of the house is ideal. You don’t want your dog jumping off mid-walk because he is distracted by something else. Warm up your dog. Start the speed nice and slow to warm your dog up. Cool down your dog. At the end of each session, gradually slow the speed down so your dog has a smooth transition off and gets a chance to cool down his muscles. Do not feed your dog a full meal immediately before you start the workout. Never tether your dog to the treadmill. We do not recommend the use of leash while your dog is on the treadmill. You want your dog to be able to stop whenever he wants (if he gets scared or feels discomfort or pain). You never want him to feel trapped. Your dog’s safety and health should always be your main priority. Just to reiterate, keeping these tips in mind will help keep your dog safe. Always supervise your dog when he is on the treadmill. Never start any new exercise program without first consulting your veterinarian. If you think your dog is unwell or injured, discontinue use of the treadmill until your veterinarian gives the all clear. Do not exercise your dog on the treadmill immediately after a meal. Never tether your dog to the treadmill. Get a treadmill that has a chord for an emergency stop and make sure it works before you put your dog on it. Always ask questions of a qualified professional trainer or veterinarian if you are uncertain at any stage of the training. Veterinary Behavior Solutions wishes you and your dog happy walking!! !